Barbara Edwards Contemporary is pleased to present Delinear, a group exhibition examining the relationship of drawing to the artistic process. Showcasing new linear work from a select group of artists, this exhibition illustrates the use of drawing through a range of artistic intentions: the sketch or blueprint for sculpture, painting or installation; the initial tracing of a conceptual idea; the idea formally realized through the drawing medium. Jessica Stockholder begins her sculptural installations in the drawing format. Acting as blueprints, loose linear sketches allow Stockholder to work out initial compositional concerns and provide rough instructions for the construction of the final works. The immediacy of the drawing tool facilitates the artist's spontaneous working process as it transmutes into three-dimensional form. Similarly, artist Robert Murray, known for his monumental sculpture, creates linear renderings that suggest sculptural forms. The work selected delineates topographical forms seen from an aerial view that were later cut into thick sheets of steel and manipulated into relief sculptures. Taras Polataiko employs drawing as a means to define complex spaces. In the work selected, Polataiko illustrates the configuration of his celebrated installation, Light Works (2005). This installation comprises a collection of light sources; their functioning controlled by ten individuals on bicycles peddling as compensation for minor offences. The drawing maps the primary concept, and allows Polataiko to order all the elements. On a conceptual, albeit more personal level, Jason McLean's drawings are visual records of his experiences, observations and perceptions. His frenetic lines are complex and often include rich annotations. McLean uses the drawing medium to develop visceral journals that pictorially represent his relationship with local environments. Toronto based artist, Howard Lonn, considers drawing integral to his painting practice. His recent works on paper manipulate the linear and graphic nature of the drawing medium in order to flatten architectural forms. These preliminary drawings provide a platform on which to speculate on the form and morphology that will be incorporated into his next group of paintings. Conversely, Tim Zuck's drawings achieve a level of resolve more commonly associated with painting itself. The work is not in preparation for other media, but rather an idea realized by experimenting with the traditional drawing material of charcoal. Zuck deftly crushes the powdery charcoal into the paper's surface, transforming our perceptions of two-dimensional space. The forms seem to hover in negative space while the eye struggles to define the linear. Landscape artist, April Gornik also recognizes the potential of drawing for fully communicating her ideas. Using line in a series of complex tonal gradations, Gornik achieves a particular quality of light as it falls on natural forms. 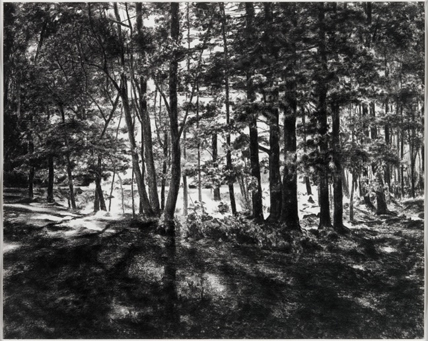 In her highly developed charcoal drawing Forest Light, Gornik's mastery for creating atmospheric space gives evidence of the breadth of drawing as an art form.